Summer is around the corner and that means I’m on the hunt for yummy snacks and treats I can make and take on the go with little fuss and zero bake time. Who needs to heat up the house like that? There is no flavour combo I like better than chocolate and peanut butter. 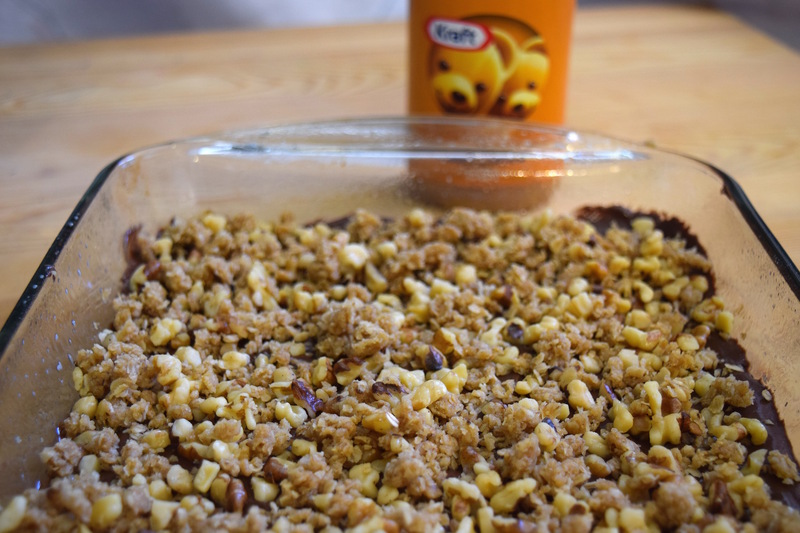 This was on my mind as I was working on this recipe – a variation on a common no-bake, cold bar style snack that is hugely popular in our house. It’s nice because it can be “dressed down” as a simple, protein filled snack to take on the go, or “dressed up” to take as a tasty dessert to your next potluck or picnic dinner! Step 1: Grease a 9×9 inch square pan. Step 2: Melt butter in large saucepan over low heat. Stir in brown sugar and vanilla. Mix in the oats, milk and honey. Cook for 2 to 3 minutes, stirring often until ingredients are well blended. 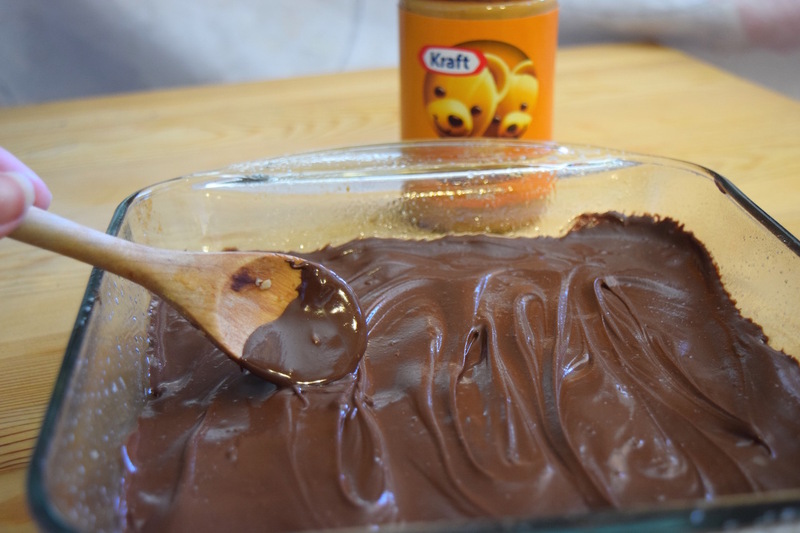 Step 3: Melt chocolate chips and Kraft Peanut Butter with Honey in a small heavy saucepan over low heat, stirring often until smooth. Step 4: Press oat mixture into the bottom of the prepared pan, reserving 1/2 cup for topping. Step 5: Pour the chocolate mixture over the crust in the pan, reserving 1/2 cup for topping. Spread chocolate mixture evenly. 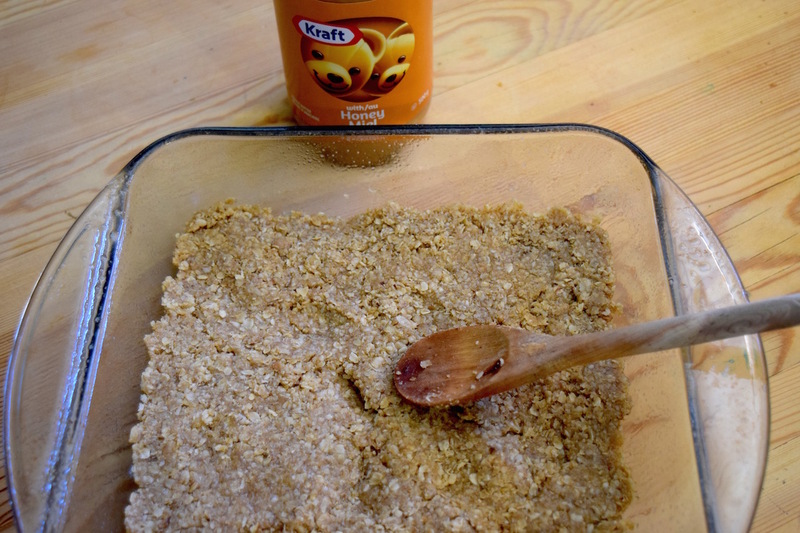 Step 6: Mix the remaining oat mixture together with the walnuts until it resembles small crumbles. Sprinkle over chocolate mixture. Step 7: Place remaining chocolate mixture into a plastic bag and snip off one small corner. Drizzle mixture over topping in a zigzag pattern. Step 8: Cover, and refrigerate 2 to 3 hours or overnight. Bring to room temperature before cutting into bars. I love this recipe not only because it’s insanely delicious and super simple, but because it’s a great one to involve my kids in. They love rolling up their sleeves and getting their hands right in there, pressing the oats and crumbling up the walnuts. Drizzling the chocolate I think is their favourite part. We had a big debate whether to use Kraft Peanut Butter with Honey or Kraft Peanut Butter with Chocolate. Honey won out this time, but I’m looking forward to making this recipe again when we try it out with the Peanut Butter with Chocolate. How amazing does that sound?! 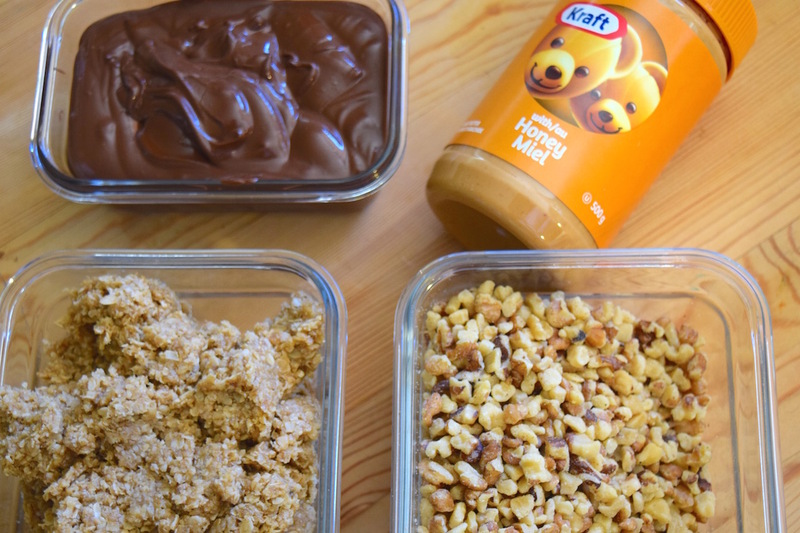 If you’ve been inspired by this recipe, check out www.sticktogether.ca for more simple and tasty recipes (with a peanut butter upgrade) that you can make together with your munchkins. With just one jar, there’s endless recipe inspiration! AND comment below sharing your favourite PB recipes to inspire our next kitchen adventure, because it’s not just a spread. 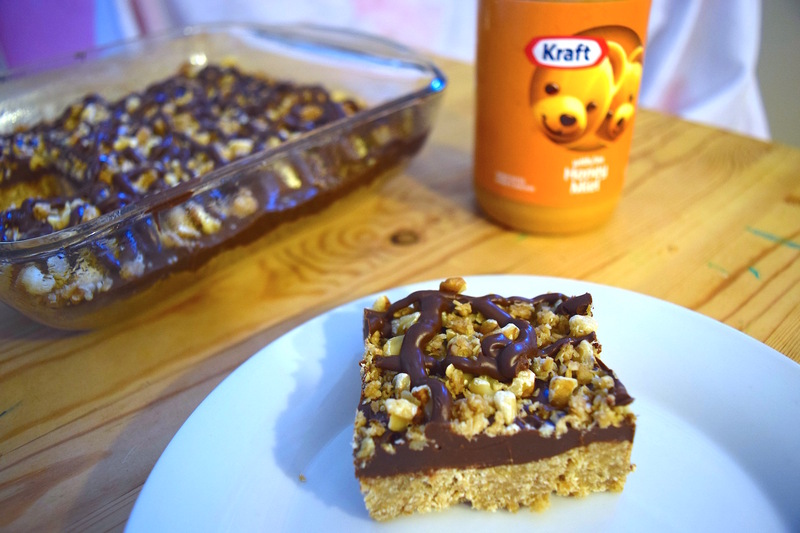 Want to win an amazing Kraft Peanut Butter prize worth $500? 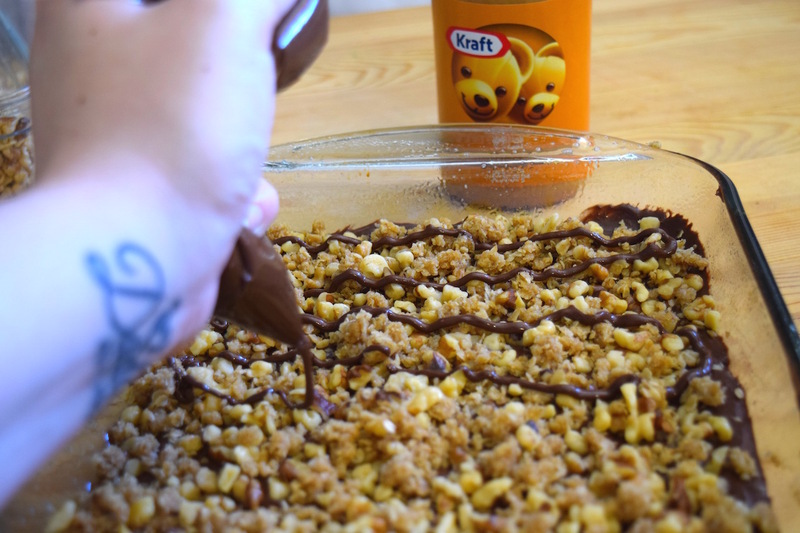 Enter the #KraftPeanutBetter it contest below for your chance to win a $300 VISA gift card and yummy Kraft Peanut Butter products. Good luck! All on the table disclaimer: Although this post has been generously sponsored Kraft Heinz Canada ULC, the opinions and language are my own”. See full disclaimer here.